Cosell Tweets: Running Backs or Quarterbacks? 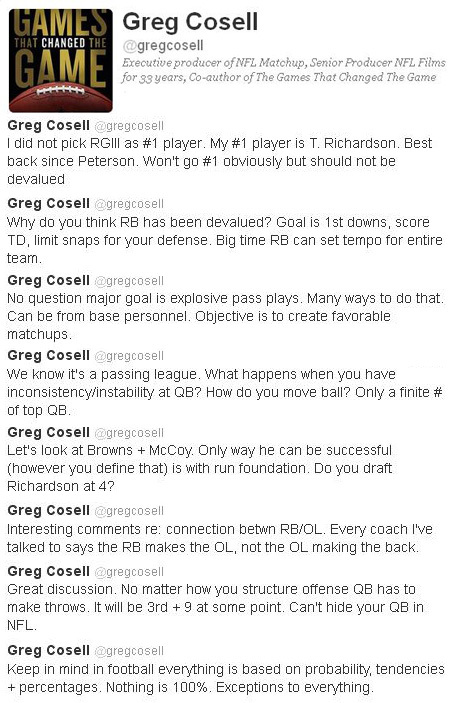 Editor’s Note: Every few days, Greg Cosell tweets his thoughts on the NFL. Today we’re highlighting his tweets about what type of player teams should build around, running backs or quarterbacks? Editor’s Note: Follow @gregcosell to read more of Greg’s thoughts on this year’s NFL Draft prospects, and more!